Changes in duration and time to onset of maximal dentate activation with repeated elicitation. One control experiment is graphed. The time to onset and duration of maximal dentate activation were measured as shown in Figure 4.9. These measurements were then graphed for each stimulus. 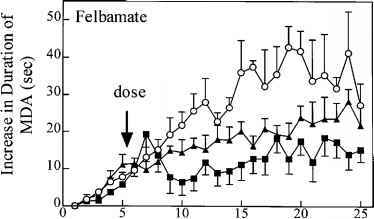 Notice that there is a gradual decrease in the time to onset of maximal dentate activation (filled squares). There is a gradual increase in the duration of maximal dentate activation (filled circles) until stimulus 15-20. Often spreading depression appears in response to a stimulus train after 15-20 stimulus trains have been administered. This pattern of changes in time to onset and duration is consistent across animals. To make comparisons across animals, the data can be "normalized," by subtracting the duration of maximal dentate activation in response to the first stimulus from the duration of maximal dentate activation measured after each subsequent stimulus train. 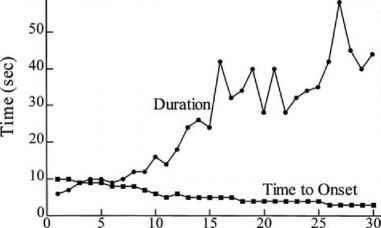 Thus, for each stimulus train after the first, a change in duration of maximal dentate activation is calculated. Data from separate animals can be averaged and comparisons made across groups of animals (Figure 4.11). Comparisons of time to onset can be made in the same way. This "normalization" is necessary because the first afterdischarge that begins the lengthening process varies considerably across animals, but the resulting increase in duration with each stimulus train is quite reproducible, with minimal variability. maximal dentate activation is altered by drugs that are usually classified as neuromodulators in the hippocampus (cholinergic and adrenergic). Reduction of GABAer-gic inhibition shortens the time to onset, and augmentation of GABAergic inhibition lengthens the time to onset. 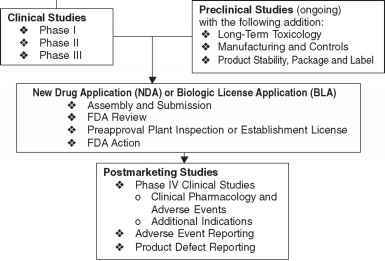 Adenosine has been postulated to be an endogenous antiepileptic agent and the findings summarized in Table 4.2 are consistent with that hypothesis. Adenosine agonists shorten the duration of maximal dentate activation and antagonists lengthen the duration.